I was incredibly fortunate to hear Carson Wentz address a sold-out crowd at Lancaster Chamber’s Annual Dinner last week. 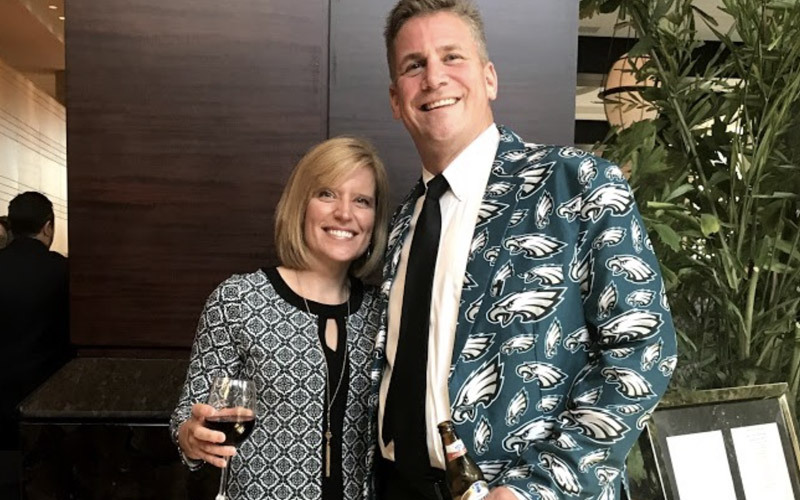 I was also fortunate to have been accompanied by the most passionate Eagles fan I know… my husband, Tom, who bleeds green. He even bought a special outfit for the occasion… okay, I bought the blazer, but he wore it well. But I would say it wasn’t his words that were most impressive to me. In fact, I didn’t find him to be incredibly dynamic nor did I find his advice on leadership to be profound. He was, well… quite ordinary. And that is precisely what was extraordinary about him. Our culture tends to put sports stars and famous people on pedestals assuming they have something us regular people don’t have. But Carson said repeatedly that he plays for his “Audience of One” and that’s what keeps him humble. It’s hard to overlook the impact of faith when you remember how young he is and just how much he has accomplished. He wasn’t a power speaker and his advice wasn’t earth shattering. He was just pretty ordinary… and that’s pretty darn extraordinary. He’s incredibly successful, very well-liked, highly respected and…. he’s just like the rest of us. Working hard to be a leader, helping others experience success around him, bringing home Philadelphia’s first ever Super Bowl championship and… he still gets nervous when he addresses a big crowd. He’s humble about his achievements and he loves the people around him that make him who he is. I’d say the night was a great reminder that – as Carson said – we all have a platform that we can use to change the world. Some of our platforms are just bigger than others. What will you do to change the world? Don’t miss out on your 401k Fund Rebates! Let’s KISS: Keep It Simple, Stupid.